Once again, come this Saturday night at the Citizens Business Bank Arena, Ontario, CA, fans will be treated to one of those battles where “Someone’s ‘O’ has got to go”. HBO’s main event will feature Andre S.O.G. Ward, 26-0-0 (KO14) versus Dominican Republic’s Edwin “La Bomba” Rodriquez 24-0-0 (KO16). Both fighters are quality individuals, having exhibited excellence from the amateurs into the professionals. Andre is talked about in P4P terms. Edwin has been compared to past greats. How can you pick a winner? It’s hard to cheer for one over the other. They are both worthy. They both have the “bona fides”. They both conduct themselves well. They’re likable and avoid all the braggadocio and trash talking engaged in by so many. 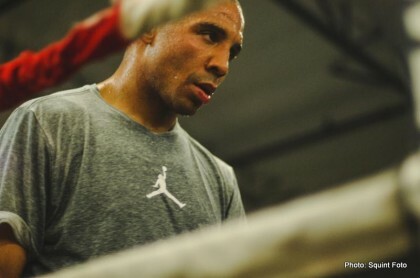 Hence, it might seem to be a tough decision to pick one over the other, but go ahead and lean toward Andre Ward. It’s gets easier once you bring up the fact that he’s a former Olympic Gold Medalist (Edwin was Nat’l Golden Gloves Gold Medalist). You need more? Ok, how about the fact that Andre has had the tougher opposition. Andre has made the adjustments needed to beat everyone from brawlers like Edison Miranda, to excellent boxers such as Mikkel Kessler and Chad Dawson. He has proved he is a master ring general. Just ask Carl Froch. Odds are, come Saturday night, he will once again demonstrate the ability to fight the fight that’s needed. If he needs to fight inside to be effective, so be it. If he has to control things from a distance with his jab, he’ll do that. If he needs to transition from righty to lefty, just watch him do that seamlessly. If he needs to roughhouse a bit, he will let referee Jack Reiss decide how much of that is permissible. He will endure any pain or difficulty without showing any feeling or complaint. Disregard the disparity in reach. That’s nothing new for him. It won’t matter. After the fight, Andre will speak fluently and coherently, even if the questions don’t make sense. His facial expression will be the same. He will remain self-assured, proving he is better than most when it comes to dealing with different situations. He seldom gets flustered in or out of the ring. When Carl Froch tried to gain the upper hand in their face off with Max Kellerman, Andre was able to verbally constrain the Cobra in a calm, confident manner. The bottom line is he’s a winner in and out of the ring. Look for him to beat La Bomba, and then move on to stifle Old Man River (Hopkins) if, as he says, the great pugilistic antique calls him out. If that should happen before Bernard starts collecting his pension, there won’t be any of that “schooling a fighter” as the “Executioner/Alien” has been known to do. Andre has already been to school, and has learned his lessons well. He’s an honor student, don’t be surprised if SOG is the one demonstrating the winning strategy. It’s easy to envision him being exact and precise with the smallest of moves, careful to avoid traps and the that famous noggin. Previous boxing news: Why me?